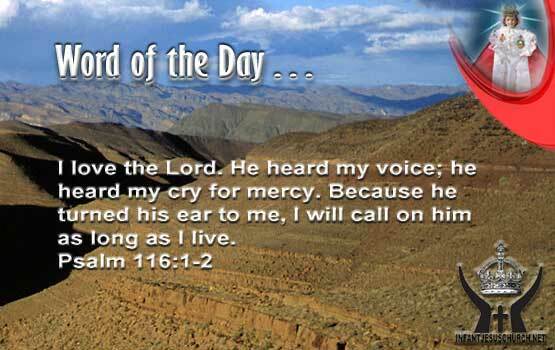 Psalm 116:1-2: I love the Lord. He heard my voice; he heard my cry for mercy. Because he turned his ear to me, I will call on him as long as I live. Heavenly Father, you know each hair on our head and every thought on our heart. Thank you for hearing our prayers Lord. Thank you for answering so many of them with the answer we sought from you. Give us patience when we cannot see your hand in the other answers that do not come as soon or do not bear the result that we request. In the name of Infant Jesus we ask it. Amen. Do we allow the Holy Spirit to enlighten and purify your mind of all that is contrary to his truth, love, and will for our life? The Holy Spirit will heal all that is broken within us and he will give us new hearts that look for to please God in all things. The Lord wants to cure, restore, and free us today from every sin and every obstruction that might hold us back from giving him our whole lives as a surrender of praise and worship. Ask the Holy Spirit to set our heart on fire with the love of God and with a holy zeal to be joint with the Father in his house both now and forever.